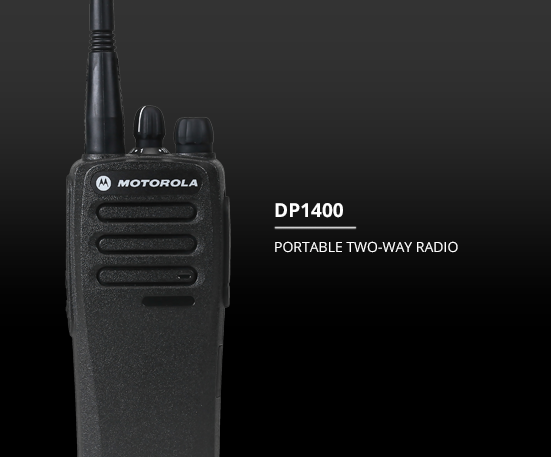 The affordable Motorola MOTOTRBO DP1400 two way radio connects your workforce efficiently and is digital mobile radio (DMR) standards compliant. Fully compatible with the Motorola MOTOTRBO™ portfolio of two way radios, the MOTOTRBO DP1400 has superior audio quality, outstanding coverage, long-lasting battery life and more. Whatever your needs, the Motorola MOTOTRBO DP1400 walkie talkie provides a simple, reliable, cost-effective communication solution to help work crews connect, coordinate and collaborate to get the job done right. ANALOGUE / DIGITAL: Get all the benefits of digital, including better voice quality, better range and better battery life – but retain compatibility with your existing radio fleet. The freedom to migrate to the latest technology at your own pace. TRANSMIT INTERRUPT CAPABILITY (decode only): Enables a supervisor to interrupt a MOTOTRBO™ DP1400 user to deliver critical communication exactly when and where it’s needed. DUAL CAPACITY DIRECT MODE: Utilise the power of the 2-slot TDMA DMR standard to double the capacity of your 12.5 kHz channel – without the need for a repeater. IP54 TARED: Dustproof and splashproof, so you can work with confidence in challenging environments. The basic package includes a NIMH / Li-Ion Battery, Single-Unit Charger, Antenna, 3″ Belt Clip (HLN8255_) & 2-year warranty (does not apply to batteries or accessories. Service From the Start packages are also available). There also is a full range of supporting accessories. 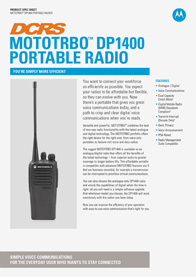 Click here to download the MOTOTRBO™ DP1400 Accessories brochure. 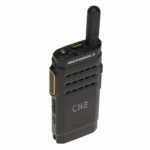 Looking for a smaller two-way radio? Why not take a look at the MOTOTRBO SL1600 two way radio.